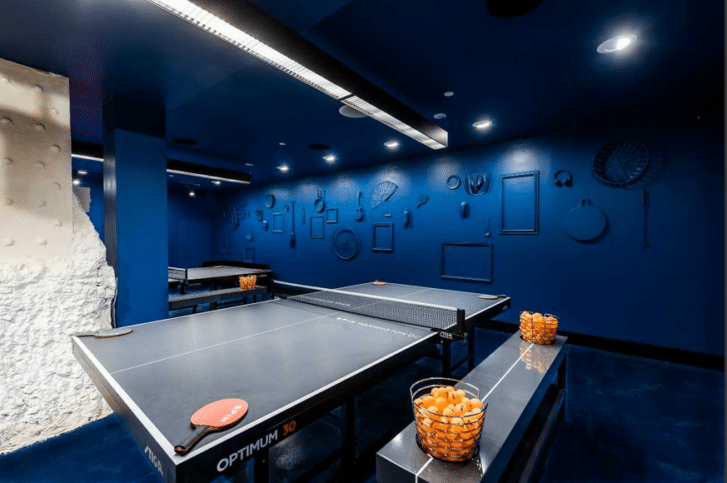 WASHINGTON — New York-based SPIN will open one of its artsy, funky pingpong clubs in time for the holidays at 1332 F St. NW in the National Press Club building. It will be SPIN’s eighth location in North America. The first opened in New York in 2009. Other locations are in Chicago, San Francisco, Toronto, Philadelphia, Seattle and Austin. The 12,000-square-foot D.C. SPIN will have 12 state-of-the-art Olympic-style pingpong tables. It includes a full bar and limited food menu, including the Burger Mac, a deep-fried hamburger stuffed with mac and cheese. It will have a soft opening Tuesday. A grand horseshoe bar that overlooks center court, two private speakeasy-style rooms set against a neon backdrop, design-filled moments such as a monochromatic blue-themed room, its notorious pingpong bathtub scene, secret bookcases with hidden passageways and a playful pingpong wind up toy installation at the entrance. SPIN’s D.C. opening special rates are $9 per hour per person, and $9 per person for unlimited play on Sunday.